Every year on the Martin Luther King holiday weekend the FUAC holds an avalanche school for the three day weekend. 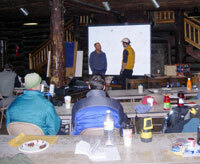 I'm lucky enough to be one of the instructors and it's based out of the Wasatch Mountain club lodge. Inside the lodge there's a big room downstairs where we gather for the classroom sessions. 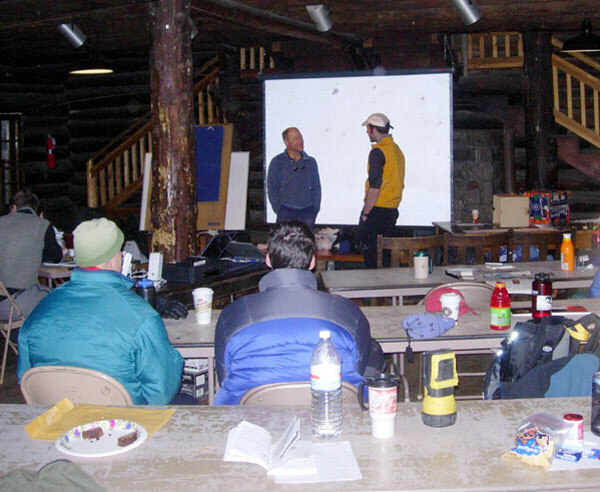 Bruce Tremper, the head of the UAC, is shown talking to a professional photographer, Matt Turley, one of the students, who has some wonderful pictures of the slides off Timpanogus last week. No avalanche course is complete without the help of the master, Tom Kimbrough. This course was no exception and we were very lucky since he was able to be there all three days, although I could have done without the rye whiskey he brought and shared the first night. The first day is spent doing beacon drills and practicing rescue scenarios. I was busy with instruction and failed to get any photos but hopefully something was learned by those I was supposed to be teaching. From the lodge I had a good view of a big slide on Millicent and was itching for a closer look. My group rode his contraption, the old two seater Millicent chair, in place, since before I learned to telemark ski. Not much room on it and best to carry the packs in front. 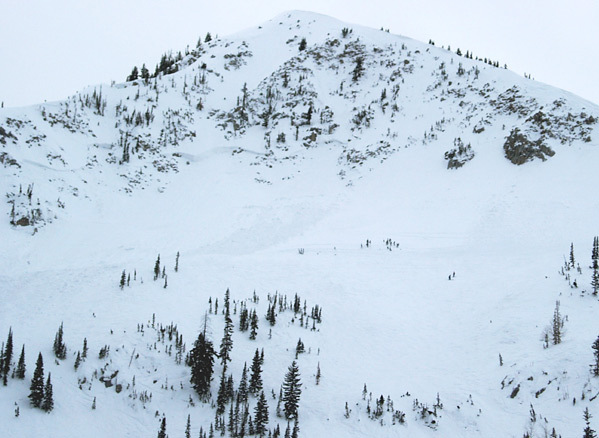 After checking with the ski patrol, who okayed the close up view, the group traversed and removed equipment booting up for a look at the crown.It was interesting with a height of 10 ft, but I was hoping to see a more distinct faceted layer. 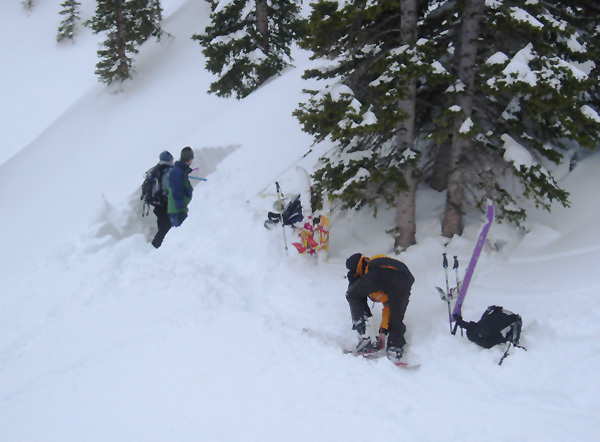 The snow safety director told me later that it originally was 15 ft.
After investigating the Millicent crown, learning all we could, with a treacherous for some, down climb back to the equipment, we left the ski area to do some digging in un compacted terrain. The first pit was dug and the time was spent showing how to do the tests, taking temperatures and densities, with an examination of snow crystals through the little microscope. Little in the way of sensitive snow was found, so we moved on. 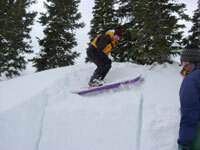 The group was split in two and each dug a snow pit in areas with a slightly different aspect in hopes of finding weaker snow layering and some variation.Snowpit testing consisted of shovel shears to identify weak layers, compression tests to determine how sensitive the layers were with an r-block filling in the hole and giving a final test. 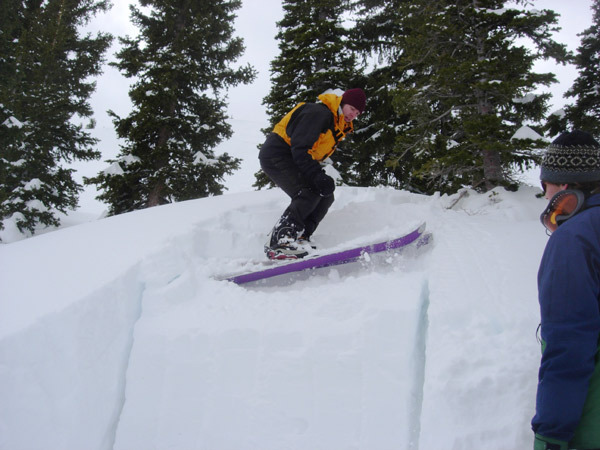 The snow was solid down 6 plus feet with a bit of a sensitive layer down a foot, but nothing jumped out with a quality shear and little variation was found on the different aspects. Should have tried a southerly face since all pits were on a shady aspect, but we ran out of time. The return was a struggle across flat terrain, since the whole group was splitboarding, except the instructor on free heel equipment. They were very good sports and didn't curse me too badly. 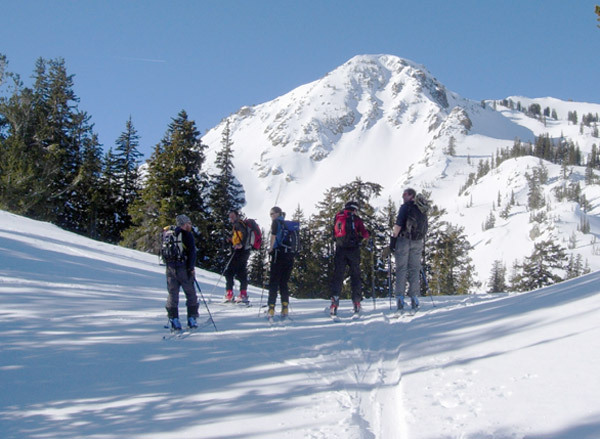 The last day of classes is a test to see if any learning had been done with safe travel and route finding the emphasis, using the information learned from the snowpits the previous day used to determine safe routes. 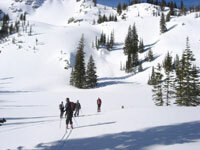 The first day of the course I used a splitboard and spent most of the day snowshoeing on verts. 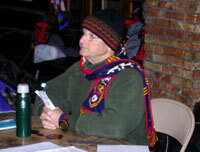 My group was mainly tele skiers. 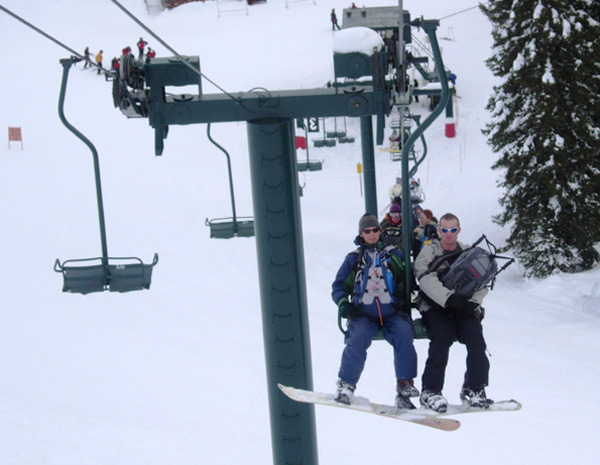 The second day I was a teleskier with a group of splitboarders. So, on the last day I splitboarded with a group of AT skiers just to keep the group integrated and each day we had a woman for safety. The route chosen for the day was to try to get over to Silver Fork for viewing of the disaster area created by explosive stability testing. 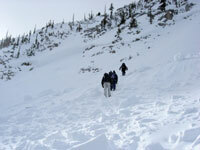 We were at the bottom of Wolverine with route options visible. It's always interesting to me to listen to the group discuss and propose options for completing the route. 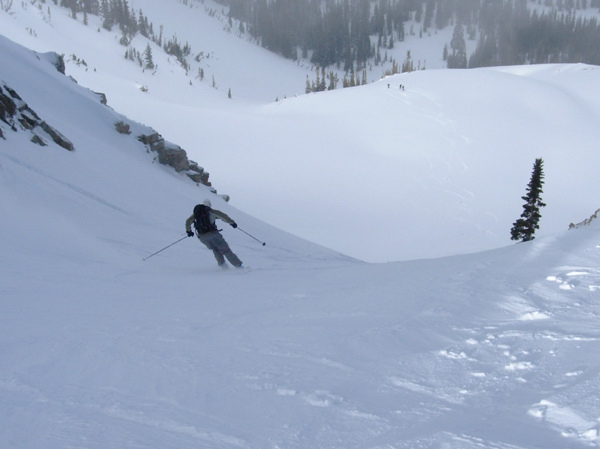 We ended up following the tree line in front of and just looker's right of the lead skier continuing up the gully visible in the top center of the picture to the summit of Wolverine. I thought it was a good choice. 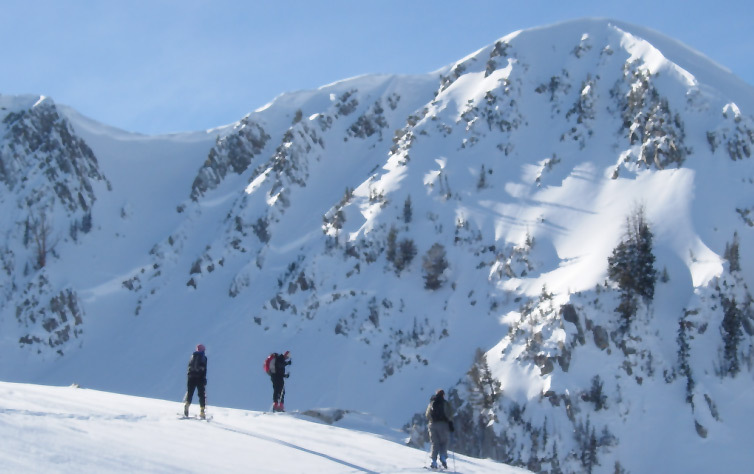 Once on top the decision was made to ski down and traverse over to Stupid chute with the name selected by others caught in slides and spit out the bottom. Three of the group are standing just out of the run out, unless the slide is very large with another headed down. At the bottom a short climb and traverse gives a good view of the infamous Wolverine cirque and the slide in the Big Chute. 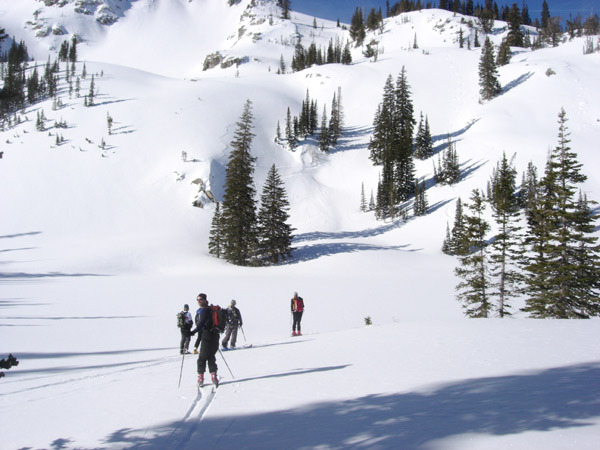 Another traverse allows skiing the Figure Eight hill down into the Twin Lakes area. We climbed out to Twin Lakes traversed around the top of Michigan City and descended into Silver Fork. 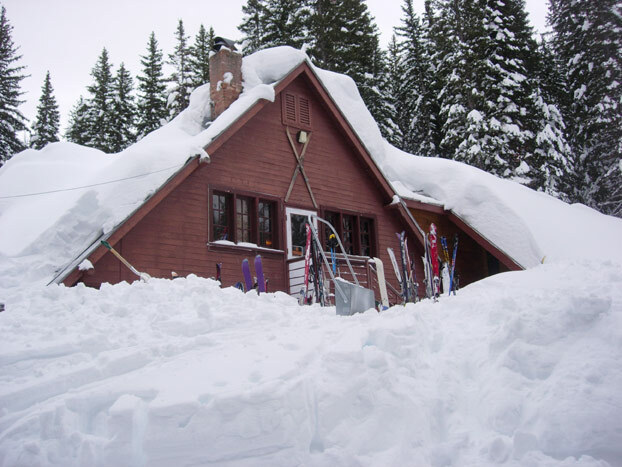 By the time we'd skied to the disaster area I was shell shocked from viewing the extent of the slides and no more pictures were taken of the mile long debris pile and our thrash through it and out Silver Fork. I enjoyed the class and my groups. Hopefully they gained some knowledge and will avoid the evil doer in the future.